We're excited to celebrate one of the most joyous days of the year: Easter! What better way to celebrate in community than around good food. 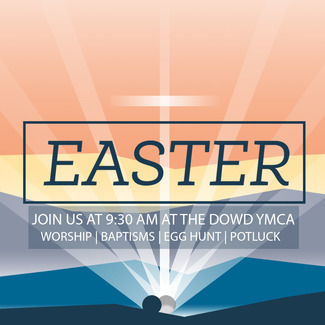 After our Easter Worship and baptisms at the Dowd YMCA, please join us at Latta Park for our Easter Lunch. We're asking you to consider bringing a food or drink item to share. Make sure it's something that can be served room temperature since we have no way to refrigerate or reheat. Redemption is providing honey baked ham and fried chicken as well as paper products. We are hoping we have a lot of visitors, so we need to be well-stocked on food! We also recommend you bring a fold-out chair or blanket to sit on. You may also want to bring some lawn games. Make sure your kiddos bring bags for the Easter Egg Hunt! The age range is 1 years old-5th grade. The rain plan is to have the potluck and egg hunt at the YMCA. We will have family in town with plans or else we would be there.